As for whether they are good buy depends upon overall condition and whether they are reeded and playing or are reeds missing and they have lain idle for some time. Regs removed from Main Stock and no sign of reeds but they could be in a box Some more clearer photographs would be useful - bass drone end appears to be bent. Thanks very much for the informative reply. I know it's near impossible to say, but roughly what do you think they would be worth and if you were to take a gamble on buying a set like this, what would the max you'd risk on them? Are you able to visit and inspect them to assess their condition and whether the reeds are with the instrument ? Do you already play the UP's ? Sorry for taking so so long to get back to this. Basically the situation is that the pipes are being sold along with a lot of highland pipes which I'm interested but the seller wants to sell everything in one batch. He has no idea of value so wants me to offer for them. 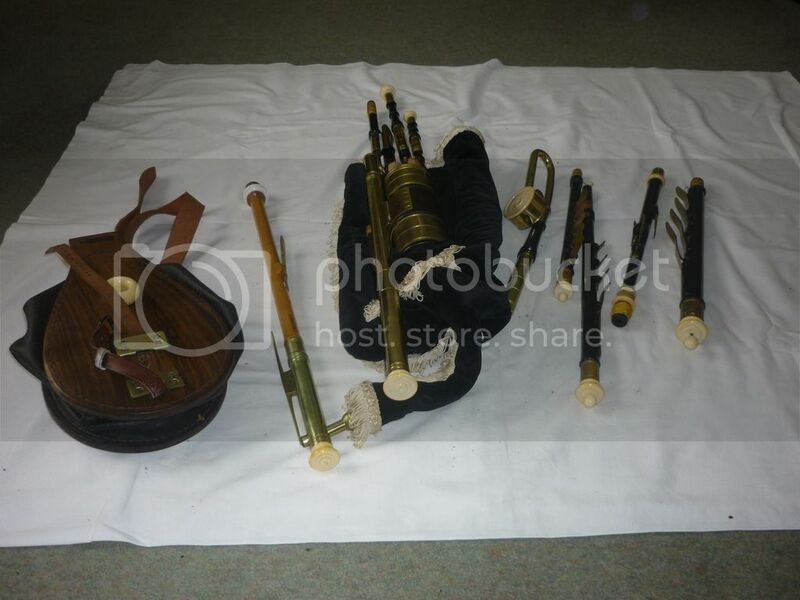 I have already told him what I'm willing to pay for the highland sets and know what I'm talking about with those but the Uilleann set is a mystery to me. What would you be willing to pay if you were to take a punt on them? A safe price that at worst, would be recoverable if selling them on? If you can base it on the assumption that they haven't been played in 5 or so years and have no reeds included. Even a rough guide would be good to have. pricing right now would be for cost of wood only, put some reeds in it and real pricing can be determined. Bore and reed characteristics are so important to the worth and value of a set... Pakistani pipes are proof of this.